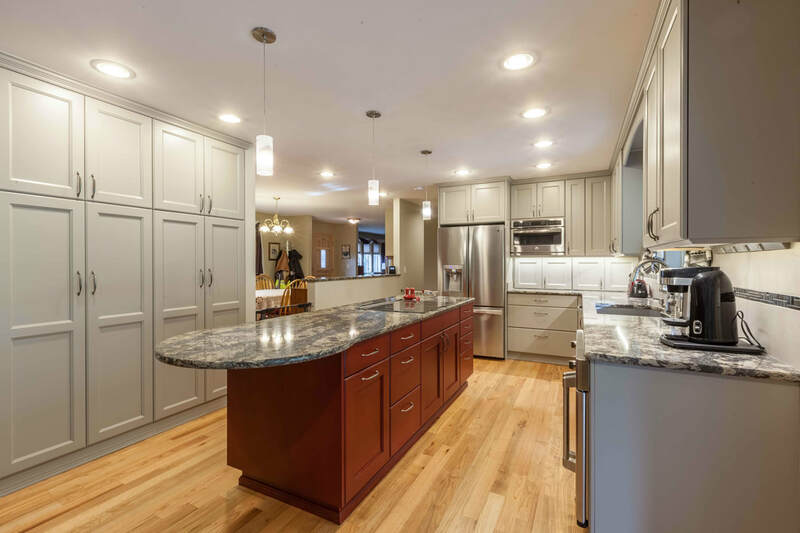 In many cases, we can achieve dramatic improvements with relatively minor changes to the structure. 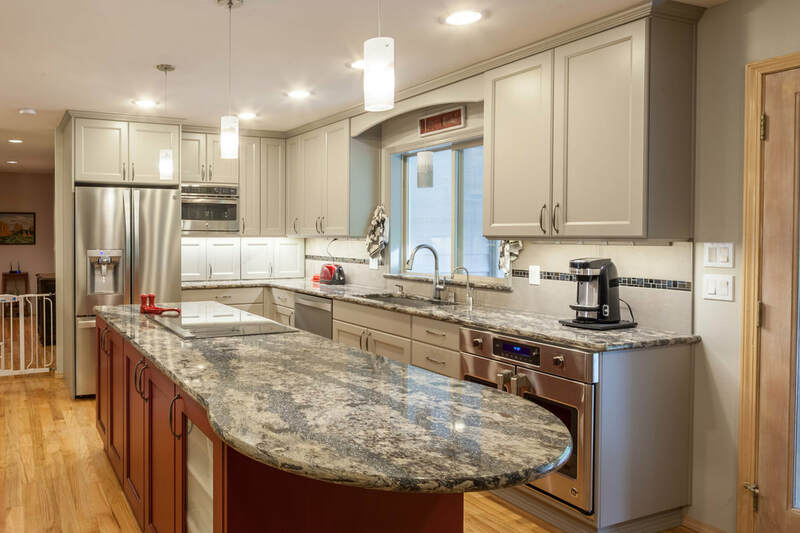 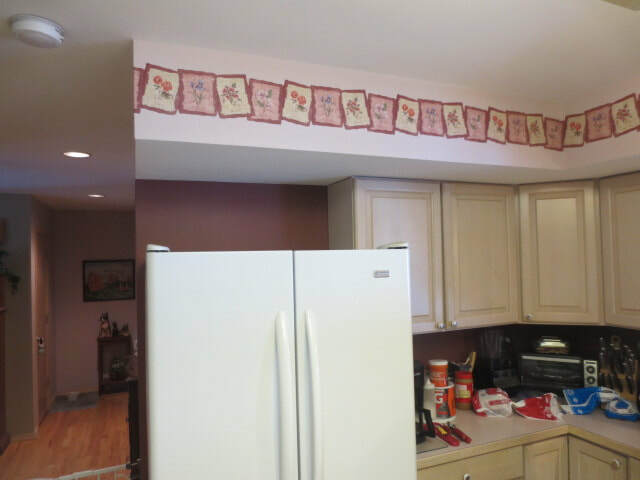 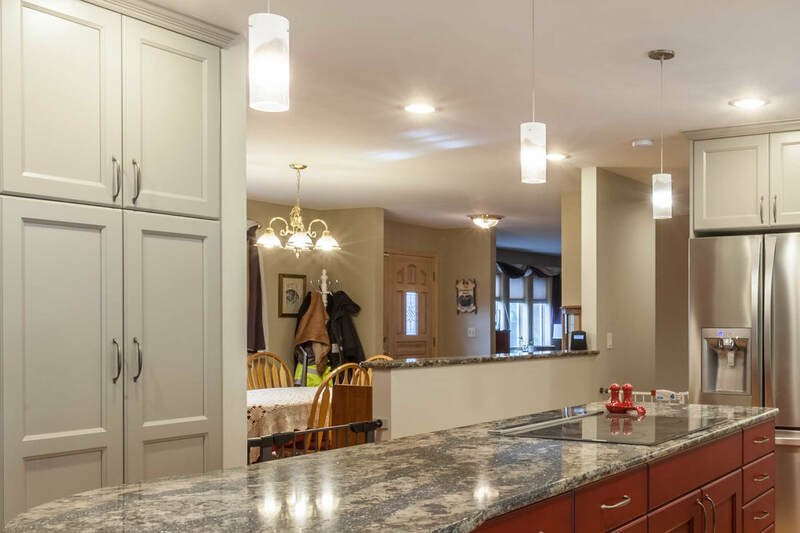 The owners of this kitchen liked the layout, but wanted to eliminate the features that had date-stamps on them; such as the soffits, the ceiling light, the wallpaper, the cabinet finish, and the appliances. Opening the wall between the kitchen and dining room was also at the top of their list. 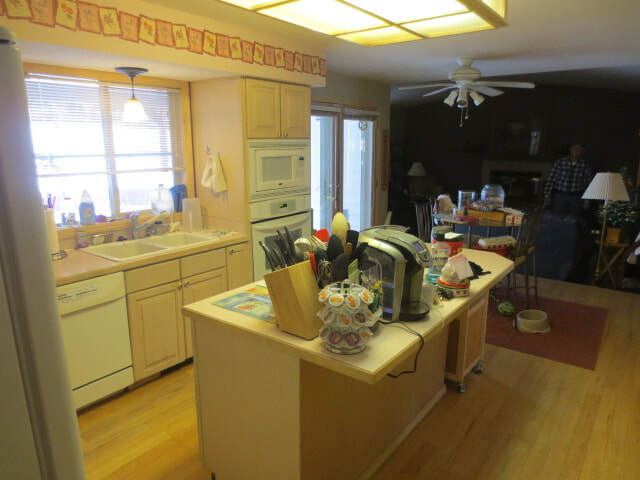 The nook table was infrequently used and the owners asked for a larger island with attached eating space, so the table could be eliminated and the walk-space opened up. The kitchen and the family room were already open and connected to each other, but the rest of the house was isolated. Opening a portion of the wall between the kitchen and dining room connected the spaces and made the nook table unneeded. Visibility clear into the distant living room makes the home feel much more open and connected. The expanded island will handle the kitchen & family room casual dining needs. We added 6" of extra depth along the refrigerator wall so we could flush-up the refrigerator, give the MW a built-in look, and use appliance garages to conceal countertop clutter without encroaching on the work space. The GE Cafe series, french-door design, oven makes using an oven under-counter, in a work aisle, a viable solution. 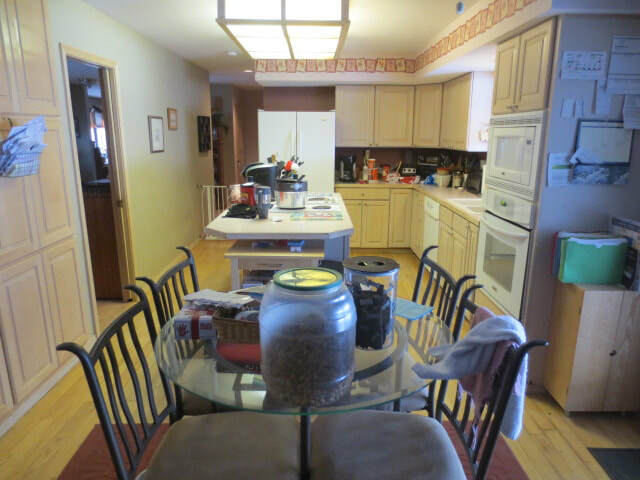 Inspiration for the red island came from a photo she found on Houzz.com. 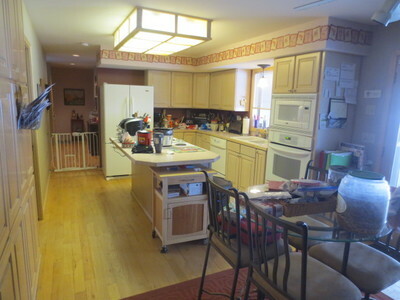 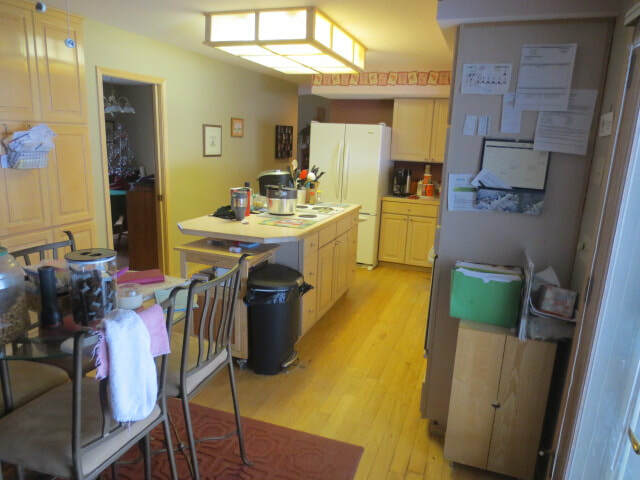 Removing the top 1/2 of the wall between the kitchen and dining room made a huge difference in usability and connectivity for the dining room. 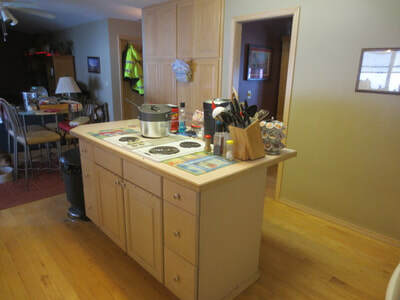 Adding a small, integrated eating space to the end of the island eliminated the formerly crowded nook table. The red island cabinetry provides some punch. 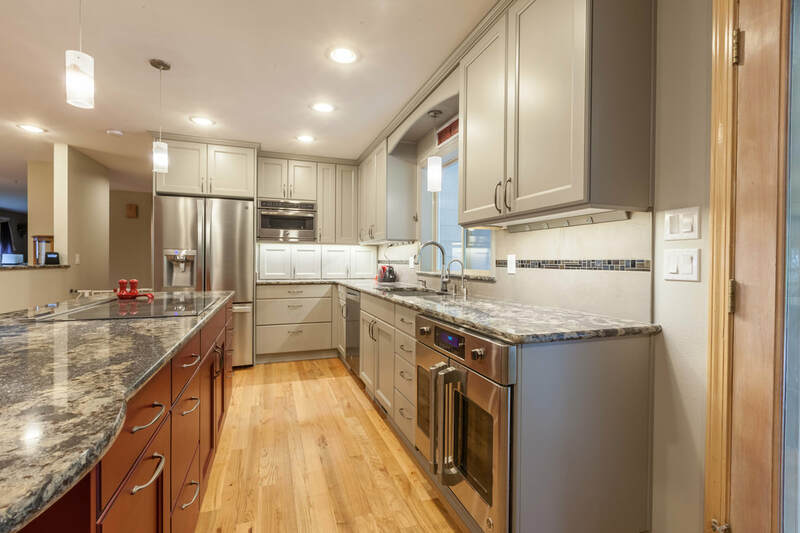 The soft grey cabinets do a nice job of lightening & brightening in a low-contrast, understated way. The GE "Cafe" series wall oven with the French Doors is perfect for use under-counter in am aisle space. This appliance garage has 18" of work space in front of it. 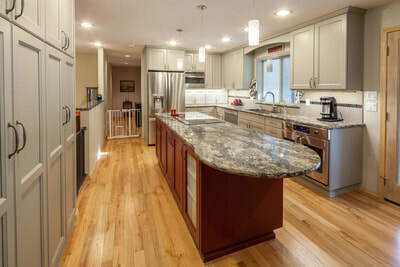 We accomplished this by adding 6" of extra depth to the cabinets and countertop in that location.